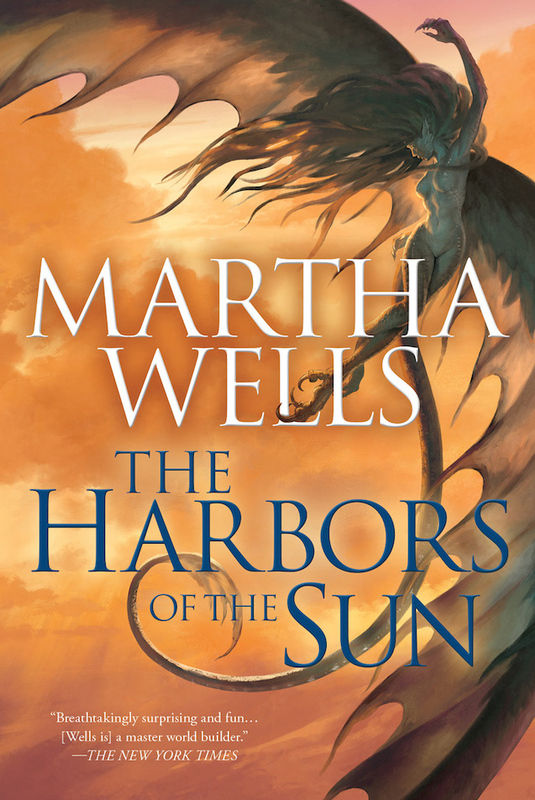 For fans of Martha Wells’ Books of the Raksura series, The Harbors of the Sun is another enjoyable adventure into the strange realm of the Three Worlds. Filled with odd creatures and species, bizarre places, technologies and magic, it’s always a place of wonder and imagination. But no story is complete without an engagement of emotion, and this one tugs at both the good and bad. There’s humor, despair, suspense, romance, devotion, curiosity and anticipation. It covers a lot of ground. From beginning to end, it’s a fun ride. As the last book in the series, this certainly isn’t a story for new readers to jump into. However, if you do want to invest the time, you can at least know it ends on a good note. For the rest of us, this journey marks an end that isn’t definitive, but is a pleasant place to stop. One last epic adventure with Raksura, Fell, groundlings and sealings with the fate of the Reaches held in the balance. The stakes are high and the main characters at the center as war threatens on two fronts. As much as the high stakes adventure drives the story, it’s funny how the little things are the parts that can captivate the most. For instance, I really enjoyed the Half-Fell queen and her Fell flight. It was refreshing to see Fell who weren’t villains. As much as I wanted to see the Raksura succeed, I also wanted the Half-Fell to find a future for themselves. I loved seeing some of the members fleshed out as characters. Aside from the queen, there is Kethel who has some fun moments with Stone and Moon. There is also the Dakti called First who stands by the queen’s side, saying more with his gestures than with dialog. The quirkiness of the Fell adds a lot variety to the story, balancing with the Raksura and the odd groundling races. At 403 pages, The Harbors of the Sun can feel a bit like a tome on par with a hefty Stephen King novel. However, unlike King, Martha Wells spins a much more enjoyable place to relax in as far as escapist fiction goes. It’s nice to read a book that’s not overly violent, predictable, or bleak. Sometimes you just need a story you can get lost in but leaves you in a good mood. This book starts with the characters split up in various places. Two groups are tracking down a rogue group of Hian archaeologists bent on unleashing an ancient super weapon of mass destruction, while a third group prepares to guard the Reaches from a Fell invasion. The plot slowly moves forward as the Raksura zero in on the Hians, but the chase leads to several stops as they pick up clues along the way. They visit strange places and towns as they hunt down the Hians. Meanwhile the Raksura in the Reaches make preparations for the impending Fell attack. Each storyline moves at a different pace, providing ups and downs in the tension as each one plays out. There comes a point when the two culminate, yet the story doesn’t end there. It continues, providing more action, more adventure, and more of the main characters. The sprawling journey takes readers on a long trip providing them with plenty to enjoy. For providing hours of entertainment, page turning suspense, and genuine laugh out loud moments that left me closing the book with a smile on my face, I give The Harbors of the Sun a five out of five metal bikinis. Whether you want to read just the first book or the entire saga, this is a great series to check out.